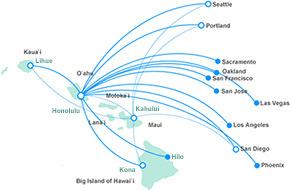 Kahului Airport (OGG) is located three miles from the town of Kahului on the island of Maui. This is the major airport for large aircraft landing on Maui. Once you’ve gathered your luggage at Baggage Claim you’ll find the car rental booths are outside the main entrance, to the right. A shuttle that comes through the booth area every five minutes, will deliver you to your rental vehicle.